Vineyard Conservation Society executive director Brendan O'Neill gave the David H. Smith memorial lecture this year at Polly Hill. Driving down Middle Road or the Edgartown-West Tisbury Road, the Vineyard may seem sparsely developed for a place that more than 100,000 people call home in the summer. An aerial view tells a different story — thousands of homes can be seen concealed from roadside view by surrounding habitat. Brendan O’Neill, executive director of the Vineyard Conservation Society (VCS), calls the disparity the great illusion. 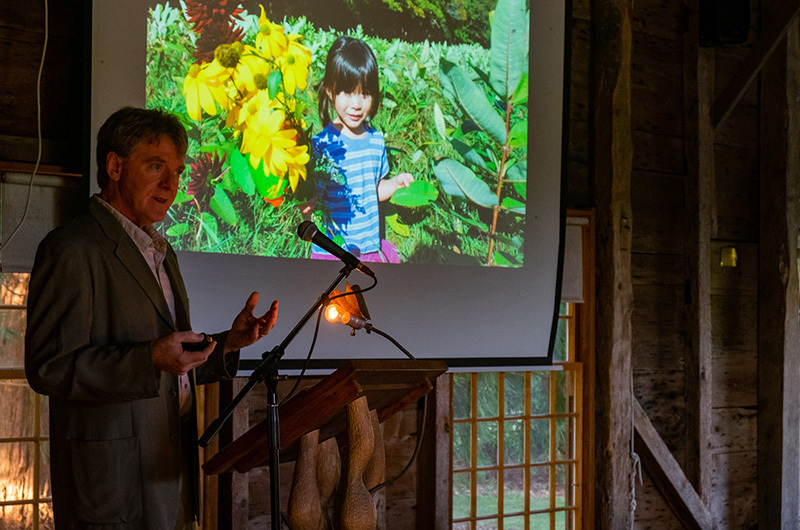 Speaking to a packed Far Barn at the Polly Hill Arboretum on an evening last week, Mr. O’Neill urged the audience to not be fooled into thinking the Island is all lush landscapes with little development. The talk, titled Conservation Outlook 2020, was given as the Polly Hill’s annual David H. Smith Memorial Lecture. Mr. O’Neill spoke about past, present and future efforts by VCS to preserve land from increasing development on the Island. Looking back at the organization’s 53-year history, he praised the actions of private landowners who worked with VCS to set aside their land for conservation. He pointed to the Mill Brook watershed as one example, where the collaborative and combined effort of private and public entities led to conservation protection in the Mill Brook watershed at places like Waskosims Rock, the Frances Woods Preserve and Seven Gates Farm. Despite the victories, Mr. O’Neill said about 2,000 acres have been lost to development in the past decade while 1,000 acres were conserved. He referenced research from the Martha’s Vineyard Commission showing that the Vineyard is currently divided into roughly three areas: conserved land, fully developed land and land potentially available for development. He said according to the MVC, 80 per cent of the available land on the Vineyard could end up being developed if no action is taken to prevent it. And the Island population could potentially double, with 7,000 additional houses and 9,000 additional guest houses. He said the time and effort required to conserve land makes it an expensive endeavor that VCS cannot manage alone. He said all sectors of the Island must make conservation a priority and urged town governments to look into adopting stronger rules and regulations to curb development. He pulled up a photograph of his daughter holding up the skeleton of a beech leaf with only the veins remaining. Much like the leaf losing its form, he said the Island’s rich natural resources could be hollowed out by ignorance or misplaced complacency. Where is the dialogue about protecting Mohu/the Graham estate? Why is this property still on the market and not being conserved? The Graham estate is EXACTLY the type of land that needs to be protected, and yet it remains available for private ownership. I am ready to give in the name of preserving that land, but which organization is currently leading the charge? Sounds like a good ratio to me for every 2 acres of land for people (and the working people are the most in danger on this island) we have 1 acre of conservation land. Please ask your group to support the working people of this Island they need it more. I am a working person on MV and I grew up here and attended school with working people. We live here because we love that our island is different from the sprawling suburbia that many new residents of the Vineyard have escaped from. We love the woods, the farms, the shellfishing and the people who believe in living close to the land and saving our healthy environment for our children. More people and more houses and more everything will destroy not only our Vineyard lifestyle but also our economy. Why would people pay to visit here if it is just as crowded as their mainland home? Conservation is the support we working people need.